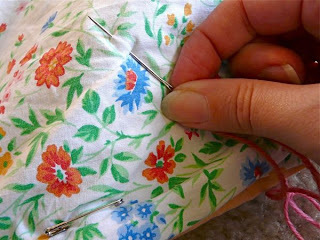 For many years it has been a custom for women to gather and help each other sew quilt patches of various designs. They would take turns meeting at each other’s home. Perhaps for a new bride they would each prepare patches for a double wedding ring design, or for someone who was ill or a shut-in, the flower garden design. Maybe for a 50th anniversary they would stitch a memory quilt, which included dates, names of children, Bible verses, and other memories that were so lovingly made by ladies for the family. Often at the "Bees" the ladies would sing, but mostly delightful chatter and laughter filled the room. It is a blessing that my mom and wife enjoy working with their hands, and over the years made many quilts for family members and friends from church with beautiful patterns. We have a quilt that my wife’s grandmother made for her, that after many years she and her mom remade using many of the original pieces. This special quilt is now our bed spread representing three generations of loving handy work. When I take the time to really look at the quilt I see those pieces stitched together as something very beautiful and think of the hours of love that went into each stitch. It also makes me think of God and how He is able to do that with our lives, if we allow Him. He often takes the mistakes and pieces that we throw away, thinking they're no longer of use, and He keeps them to make something special out of them. Often He takes us through valleys that are deep to teach us to trust in Him, and we wonder when it will end. And then the mountain top comes into view, and we realize without the valleys the mountain might never have been reached. If we truly give Him our daily struggles and broken pieces of our lives and allow Him to work by making us whole, He is able to design something beautiful. Just like all the different scraps that we can't imagine will be something pretty, a lovely quilt is made. God is like that, if we leave the worries and scraps of our lives at His feet, without taking them back, He delights us by giving us beauty beyond what we could ever imagine. Quilts are very popular today and we see them in department stores, antique malls and specialty shops. Next time you see a quilt take a minute and remember that God has put you together like a quilt with a collection of parts and when it is all together it is the masterpiece that He has wanted for you. Dear Lord, we thank You that You have made us a beautiful quilt. Help us not dwell on the little pieces of our life but how You put them all together to be something special. In Jesus’ Name, Amen.